The Rams traded away premium draft picks and spent big money on players to build a Super Bowl contender. Just two years ago, the Los Angeles Rams were coming off a 4-12 season. In 2016, they had one of the worst offenses in NFL history, averaging just 14 points per game and 4.4 yards per play. They finished with under 3,000 passing yards for the entire season. Now they’re headed to Super Bowl 53, completely rebuilding their team in a two-year span. What makes this even more impressive is that they’ve done it without a first-round pick in 2017 or 2018. With a new young head coach in Sean McVay, the Rams took a different approach to team building over the past two seasons by trading away premium draft picks for players and signing high-priced free agents. Their unorthodox plan to turn one of the worst teams in the league into a Super Bowl contender has been a resounding success for the NFC champs. Here are the three major things that went right for the Rams during their roster rebuild. Jared Goff’s rookie season with Jeff Fisher as his head coach was a total disaster. In seven starts, Goff went 0-7, completed 54.6 percent of his passes, and had a passer rating of just 63.6, which was the worst in the league among all passers with at least 200 attempts that season. Goff looked like he was on his way to being a colossal draft bust. That would’ve been a massive setback for the Rams considering what they gave up to draft him: a 2017 first-round pick, two 2016 second-round picks, and both a 2016 and 2017 third-rounder to the Tennessee Titans. Luckily for the Rams and Goff, they hit a home run when they hired McVay to replace Fisher following the 2016 season. In the two seasons that McVay and Goff have been together, Goff’s passer rating has skyrocketed. Goff has a passer rating of rating of 100.8 through the 2017 and 2018 seasons — that’s good for sixth among all quarterbacks with at least 500 throws in that timespan. His record as a starter during the regular season is 24-7 in those two seasons. The Rams offense has been one of the best in the league since, finishing in the top two in scoring both years. The combination of McVay and Goff has been huge for the Rams, but they haven’t done it alone. Their 2017 draft class has been crucial to their success as well. Entering a draft without a first-round pick is always a challenge — especially in back-to-back years. Still, the Rams were able to find quality players who have played a big role in their run to the Super Bowl. Their first pick in the 2017 draft was tight end Gerald Everett, who was selected with the 44th overall selection. Everett hasn’t been overly productive in his first two seasons (564 receiving yards in 32 career games), but he did catch the game-winning touchdown in the Rams’ 54-51 win over the Kansas City Chiefs this season. He also caught two passes for 50 yards in the Rams’ NFC Championship win over the Saints. In the third round that year, they selected wide receiver Cooper Kupp and safety John Johnson. Both of those players ended up being instant starters for the Rams. Kupp was well on his way toward establishing himself as one of the more reliable receivers in the league before tearing his ACL in Week 10 against the Seattle Seahawks — Kupp has totaled 1,435 yards and 11 touchdowns in 23 career games. Johnson started all 16 games in 2018 and turned in a monster season for Wade Phillips’ defense. He finished the regular season with an eye-popping 119 tackles, 11 passes defended, and four interceptions. Right now, Johnson is most famous for intercepting Drew Brees in overtime of the NFC Championship Game. That set the Rams up with great field position for their game-winning kick that sent them to the Super Bowl. After Everett, Kupp, and Johnson, the Rams drafted wide receiver Josh Reynolds in the fourth round. Reynolds has been Kupp’s replacement in the lineup and had a solid game against the Saints. Reynolds caught four of his seven targets for 74 yards and also added a 16-yard run to set Los Angeles up on the 1-yard line. The Rams scored a touchdown two plays later. Then, his 33-yard catch put the Rams in field goal range halfway through the fourth quarter. There were more projects in the Rams’ 2018 rookie class, which hasn’t had as big of an impact, outside of defensive end John Franklin-Myers. But they haven’t had to, either, because they took big swings for established players in free agency. Right before the 2017 season, the Rams traded cornerback E.J. Gaines and a 2018 second-round pick to the Bills for Sammy Watkins and a 2018 sixth-round pick. After a 519-yard, eight-touchdown season, the Rams let Watkins walk in free agency and then traded away their 2018 first-round pick to the Patriots for Brandin Cooks. So two years in a row, the Rams traded away high draft picks for receivers that they felt could help immediately. Cooks will be in Los Angeles for the long haul — shortly after the trade, Cooks signed a five-year, $81 million deal with the Rams. Cooks and Watkins haven’t been the only big splashes the Rams have made at wide receiver. A few months after McVay was hired, the Rams signed former Bills receiver Robert Woods to a five-year, $34 million contract. Woods had a career season in 2018, totaling 1,219 receiving yards and six touchdowns. Los Angeles also made two key signings on their offensive line prior to the 2017 season. The Rams gave a three-year, $33 million contract to stud left tackle Andrew Whitworth, who the Bengals inexplicably decided not to retain. They also signed John Sullivan to hold down the center spot. These moves did not come without risk — Whitworth was 35 years old when he signed his deal and Sullivan was 32 in his first season with the Rams. Both of those signings paid off right away — the Rams jumped from 29th in sack percentage in 2016 to ninth in 2017. Their yards per carry also rose significantly from 3.3 yards per carry in 2016 (31st) to 4.3 (seventh) in 2017. Whitworth in particular has been spectacular, making a few highlight-worthy blocks per game for the Rams. Andrew Whitworth may be the most underappreciated player of his generation. The offense wasn’t the only beneficiary of the Rams’ aggressive style of talent acquisition. The Rams traded away their 2019 second-round pick in a package for cornerback Marcus Peters, sent a fifth-round pick to the Broncos for cornerback Aqib Talib, signed defensive tackle Ndamukong Suh to a one-year, $14 million contract, AND made a midseason trade for defensive end Dante Fowler. To land Fowler, they gave up a 2019 third-rounder and a 2020 fifth-round pick to the Jaguars. Paired with Defensive Player of the Year Aaron Donald, Suh, and Fowler give the Rams a terrific trio of pass rushers — especially when Suh and Fowler are on top of their game. Fowler’s hit on Brees in overtime forced the errant pass that Johnson was able to intercept. The Rams’ ambitious strategy worked out as planned. Those players have all helped them reach Super Bowl 53. Los Angeles may run into a problem with a minimal amount of draft picks and an eventual contract extension for Goff, but its style of roster building has paid off in the short term. But just because the Rams have spent a lot of resources to make this 2018 Super Bowl run, it doesn’t mean that they’re destined to regress in the near future. 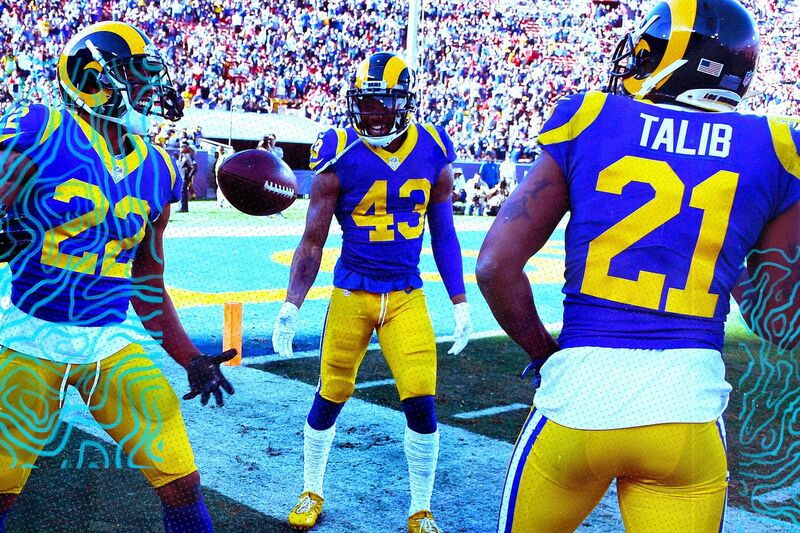 They’ve already locked down homegrown talent like Todd Gurley and Aaron Donald with lucrative extensions, all while stocking the roster with talent. They have a head coach and front office that aren’t afraid to think outside the box, and they’re being rewarded by being one win away from a Lombardi Trophy. If the Rams are able to take down the Patriots in Super Bowl 53, we might see more NFL teams take a similarly bold approach to their offseason.